I originally painted these vanities with Annie Sloan chalk paint and wax in March 2016–so about 15 months ago. 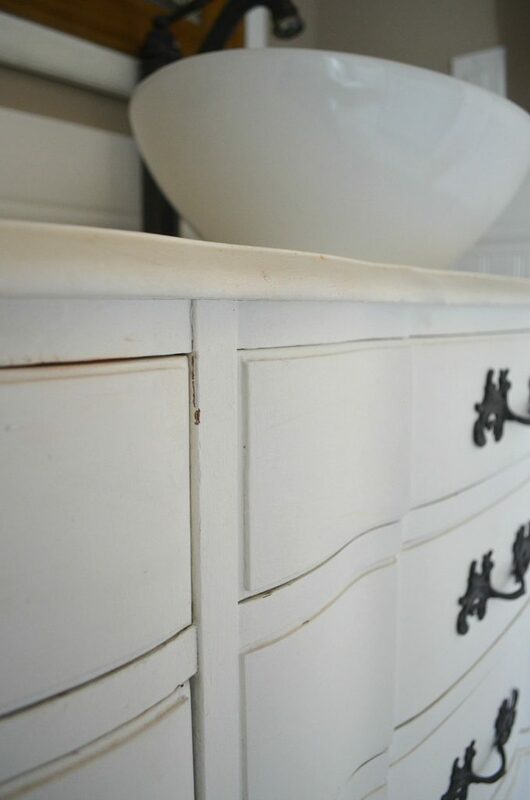 At first I was happy with how they looked, but within 2-3 months both vanities were covered in lots of chipping like this. And NOT the good kind–I definitely wasn’t going for a distressed look. Plus the whole thing just had a dingy appearance because I could never get it clean with the chalk paint/wax combo–everything stuck to these like glue! But the worst part of all was how it was holding up around the faucets. You can see water damage starting to form and lots of cracking. Bad, bad, bad. It was definitely past time to re-do these vanities and stop any further damage from happening. So for this process I started by sanding the dressers to remove the wax and prepare the surface to be repainted. It was a total pain to do this step, but I definitely didn’t want to go straight in over the wax with new paint. That old stuff needed to come off and this was the only way I could do it. My goal was not to sand off all the old paint, I simply wanted to remove the wax topcoat and roughen it up. Once I had that done I started painting. This time I chose to use the Rust-Oleum Chalk Paint in White Linen. I went this route because I wasn’t sure if latex paint would adhere over the old chalk paint. Thankfully it worked very well and went on just fine. Once I had the fresh paint on the next step was applying the polycrylic. I really believe this is the most important step in the entire process, even more important than which paint you use. Had I done this project with polycrylic the first time, I’m confident they would have held up fine. I actually did a chalk paint/polycrylic combo on our dining table about a year ago and it’s held up wonderfully, so I felt pretty confident with this pairing. I used water-based clear polycrylic in satin. I put it on using a good quality paint brush and simply brushed it on with the direction of the grain of the dresser. I seriously love this stuff. It goes on easily and dries fast! Just make sure you put it on in long, even strokes and don’t go back over the area you already did. If you do, it will start to ball up and get clumpy. Sooooo much better–no more cracking and chipping paint. And no more dingy, dirty white! The thing I love most about that polycrylic is that it dries to a clear, glass-like finish. Now these dressers are so smooth and easy to clean. I’ll tell ya, it was nearly impossible to get makeup and other stains off the vanities before, but it cleans up like a breeze now. I can’t even tell you how happy I am to have this project off my to-do list. Seriously, it’s been hanging over me like a dark cloud for months now. I was totally dreading it and kept putting it off, but I’m so glad I finally got my booty in gear and did this the right way. Like I mentioned earlier, I think the polycrylic topcoat is absolutely key when you’re painting anything that will get even moderate use. As much as I love chalk paint, I just don’t think it’s strong enough to hold up to daily use when you only cover with wax. In my experience with these vanities, the wax just isn’t strong enough–especially when it comes to anything that gets into contact with water. This was definitely a hard lessoned learned, but at least I get to share my lessons with you guys, right? Please let me know if you have any questions at all, I’d love to to chat in the comments below! I could not agree more! I have tried chalk paint on several items so far and only one peice held up with out some primer or extra wax or sealant afterwards. It chips and peels! So although I really love the texture and colors and feel of the chalk paints it definitely needs a quick coat of primer in my experience and a good thick coat of the wax or some other sealant afterwards. Your vanities turned out so nice! I couldn’t agree more, the chalk paint is great but only if you want a distressed/chippy finish. Otherwise it ain’t good on its own! This looks amazing. 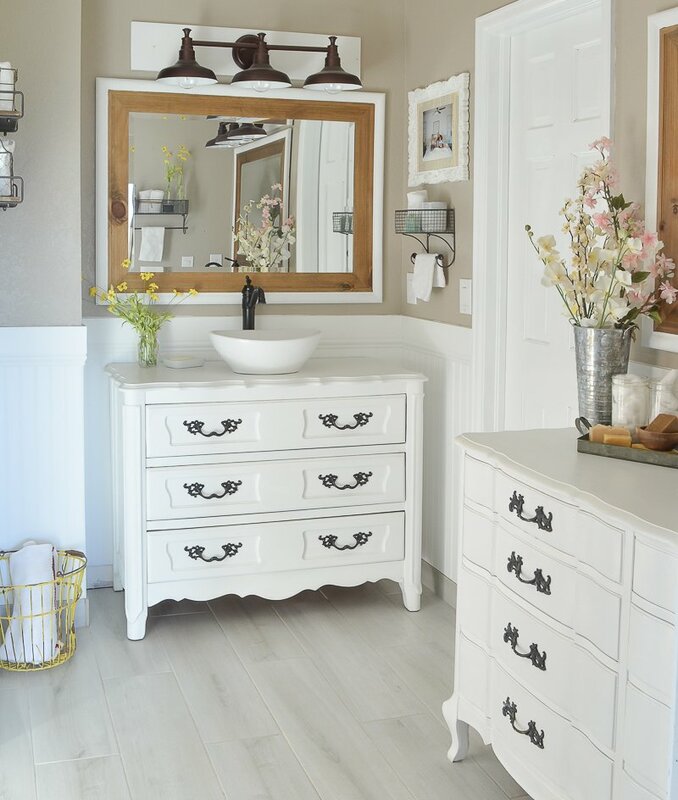 Both vanities are fabulous and such great storage too. 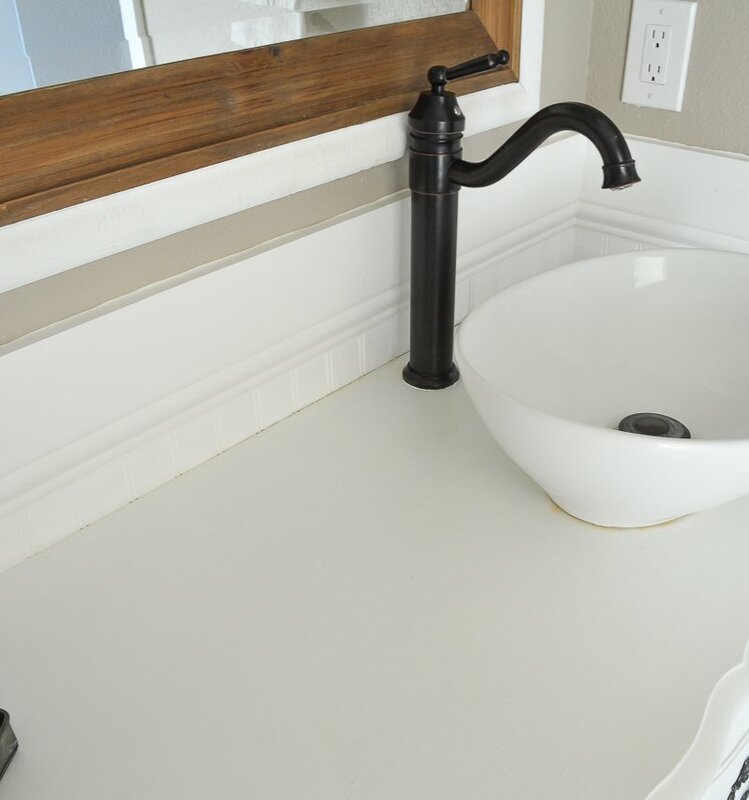 How did you sand around the faucet? Did you have to take everything apart? I didn’t remove the faucet, I just sanded around it with a loose piece of sand paper. Seemed to work fine! 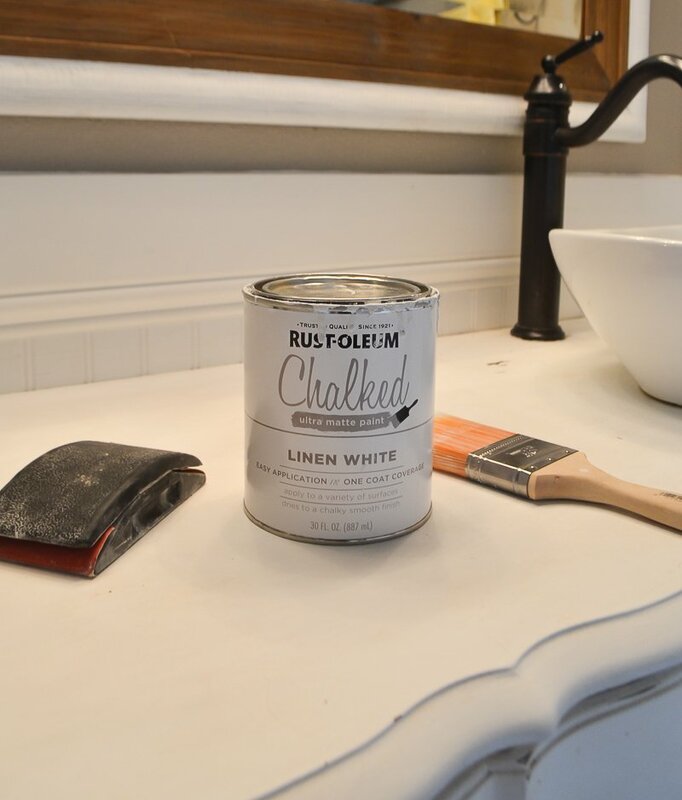 Funny that you used the Rustoleum chalk paint- I too have used it recently on several projects. I love how easy it is to work with, but the durability definitely isn’t great on its own. So I too had to use a poly coat over it and I’m hoping that helps it stay nice???? Without the poly it seems like it wasn’t sticking well to anything. (I did bathroom cabinets too with it). Yep, I think the poly is key!! I do a lot of painting with chalk paint. For my small projects, I use waverly brand chalk paint from walmart. It’s about 5 bucks for an 8 ounce bottle, and it covers about 20 square feet, which for small pieces of furniture, is a lot! At first I purchased Martha Stewart wax, but as I read the instructions it said to reapply every 6-12 months or as needed, so I ended up not using it and I purchased some duraclear brand varnish from michaels, since I only use a little at a time for smaller pieces. 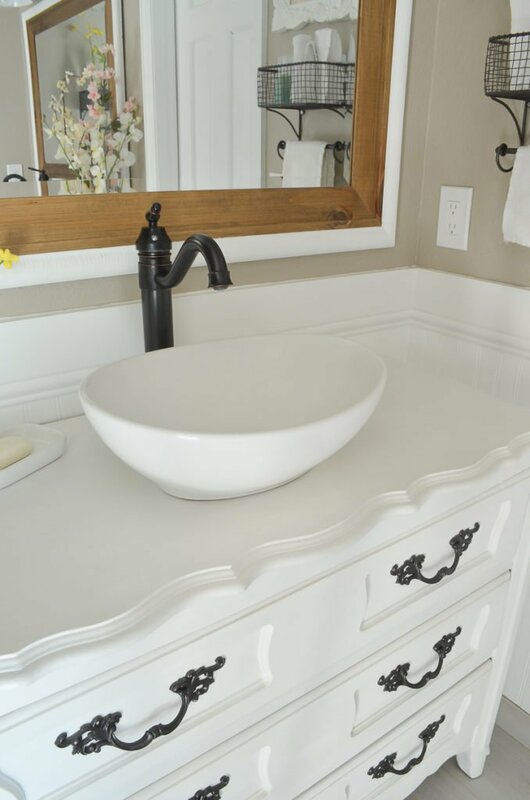 It really stinks that you had to repaint your vanities, but they look gorgeous and should last a very long time. I haven’t tried the Waverly brand yet, I might need to pick that up and do a little test run. And I’ve heard that recently about the wax too–needing to re-do it every few months. Craziness if you ask me. Who has time for that?! ???? I love your bathroom!!! It’s SOOOO cute!! And I recently did our dining room table with chalk paint and wax, and it’s started coming off already ???? So I was going to redo it with a poly and I’m so glad to hear a review on which kind to get! ???? Yesssss Elisabeth, definitely do it again with the poly. I think you’ll be amazed at the difference!! I’m new to this entire arena of decorating and have just purchased a 6 bedroom farm house. Your blog and all the amazing photos and info are helping me with this fun adventure! Thanks so much for all your hard work and research. It’s making life much more fun for me. Aw thank you Sharon, I’m so happy you have enjoyed my blog! Good luck with your farmhouse, it sounds amazing. Thank you sooo much for this update. I love your bathroom. 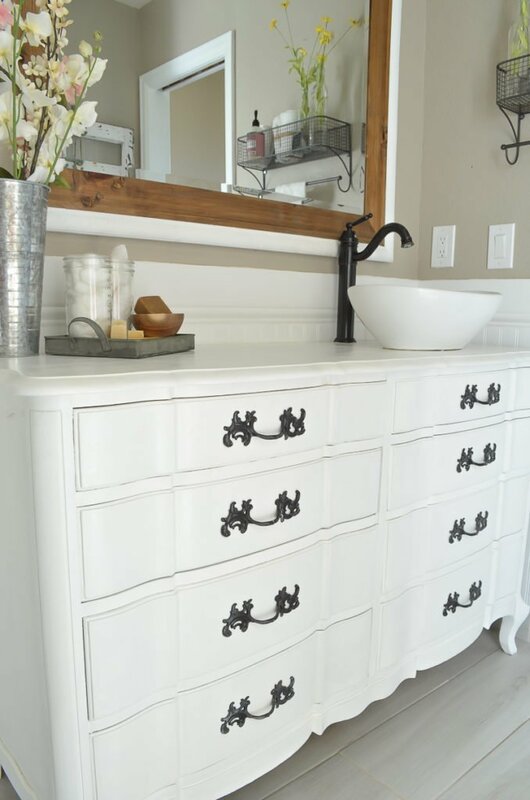 I saw the original post and my upcoming ensuite is based on your vanity…..I have one similar waiting to be repurposed. I have recently painted the vanity in the existing bathroom with paving paint as an experiment and I’m waiting to see how that holds up. I have to do the one in waiting in the next few months and I think I’ll try this combo you suggested. ( if youre interested the paving paint seems to be very water resistant. It’s black and doesn’t appear to be marking much, although it’s not had very much use yet. Paint guy said it didn’t need sealing but if it looks like it will mark with makeup etc I think I will splash polycrylic on at some stage) Love reading your posts and the info and tips you put up. I am a new follower of yours and I enjoy it. Have to admit I look for your email first thing every morning! Although I am not a true farmstyle decorator, I find myself drawn to many of your projects! As I read this post about your vanities, I wanted to share something that has worked beautifully for us. Our kitchen cabinets were oak and I was very tired of them! Finally convinced my husband that we should paint them. I washed them with a solution of warm water and TSP. Once they were thoroughly cleaned, my husband applied a thick primer, STIX, which came highly recommended at the paint store. We then used Benjamin Moore ADVANCE water borne interior alkyd satin finish paint. It is made specifically for kitchen and bathroom cabinets. I have used it on the vanities in both bathrooms. I recently painted a corner cabinet built by my great-grandfather in the late 1800’s and it looks fabulous! Paint dries very hard and can be easily washed. We have had virtually no chipping. We are extremely happy with this product! I apologize for this lengthy comment. Good to hear -we have just finished doing our kitchen cabinets with Advance paint too. Long story but our first color choice …. a beautiful gray ended up looking blue in our kitchen-we realized this only after all 28 cabinets were done, so off to Benjamin Moore we went . They are now cloud white and I’m thrilled with them , We loved working with the Advance and happy to hear it’s holding up nicely. Good to know about the BM Advance! I’ve never used it. 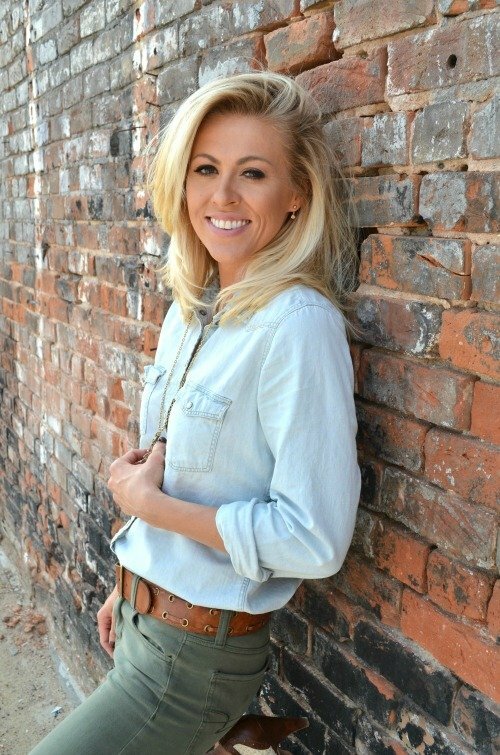 I love your blog and I use Benjamin Moore also! I have had a lot of problems with all chalk paint! I guess I am not a fan of the wax! Thank you for all the projects you do! Hi Dot! Wow, I have never heard of either of those products. I’m amazing to know your cabinets haven’t chipped at all–that is seriously impressive! I’m going to make a note of this and definitely try out those products if we ever paint our kitchen cabinets. Thankfully they’re a pretty decent color now, so I don’t plan to do it any time soon, but this is the route I will go if we do. Thanks for the info! They look great but what’s more amazing is that you took on this project 9 months pregnant! You are truly gifted and are just moving in that . Bless your heart. Ha, thanks Marilyn! I think part of my drive to get this done was all due to nesting. I wanted it off my mind and out of the way before baby came!! I’ve had the same problems with that chalk paint. Please let us know if you sealer starts to yellow. Thanks for the post. 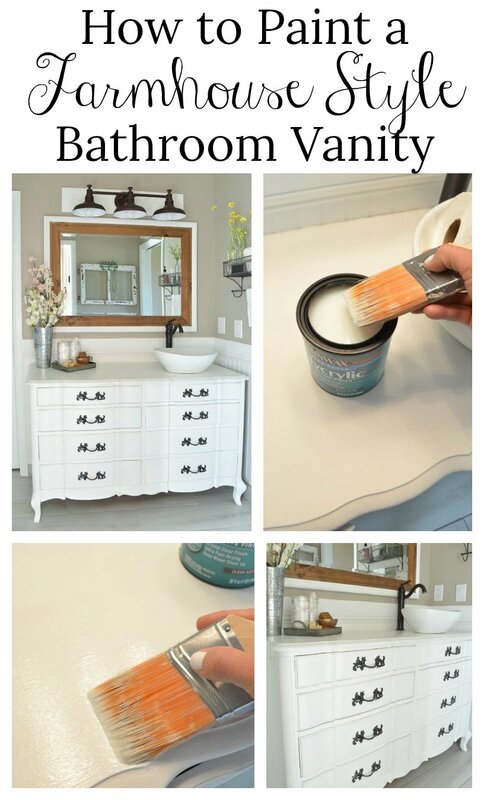 Your vanities look fantabulous! Thanks Cindy, I’ll definitely share an update on how these are holding up in a few months. I’m really hoping there is no yellowing or other issues, I don’t think I can do them again! Looks great. My dining table really needs to be sealed but I keep putting it off. Maybe I’ll get off my tush and do it! Thanks Chelsea, fingers crossed this holds up well! It looks great. I’m sure the poly will hold up much better. Please update in a few months. My daughter wants to paint her kitchen cabinets and we keep putting it off out of fear of messing it up. If they could look as good as your vanities, she would be really happy. I’ll definitely share an update on these in a few months. I’m really hoping these hold up well and I don’t have to do it again! I have yet to tackle a full kitchen cabinet project, good luck!! I hate you had to re-do both vanities but man that look awesome. I’m glad to know the “finish” tip as it i TOO MUCH work to have to re-do. I agree who has time or the energy for that!!!!!!!!! Love love you bathroom!! What great tips and amazing talent you have Sarah. Did 1 quart of the chalk paint and poly cover both vanities? I’m going to redo our tv console and a couple of smaller projects soon and was wondering if I should get more than that. How tall are your vanities? I found a dresser I would like to convert to a vanity but am concerned it will be too tall. I love this. I’m actually buying a dresser today to be used as a vanity that has the exact same paint combo on it (Annie Sloan chalk paint in graphite + dark wax). Do you think I can just apply the Poly product on top as-is to protect the finish or do I need to lightly sand off the wax finish first? Thanks!! 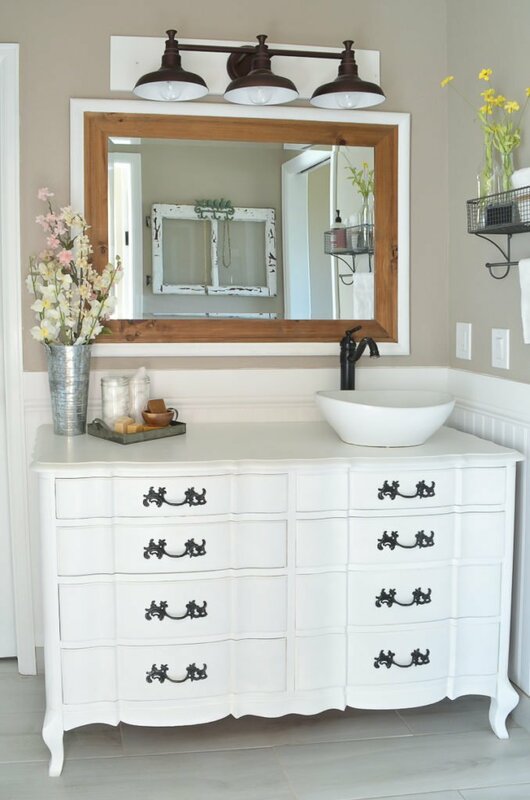 I’m thinking of doing the same to my bathroom vanity using rustoleum chalked paint in charcoal and then wipe on poly. I also have polyacrylic but thought wipe on poly might be easier to work with. Can you give us an update now it’s a month later, how has it held up? Do you think it’ll last a few years? Hi Julia, it’s held up great in the past month. I don’t foresee having any issues with it at all actually. I chalk painted our dining table almost 2 years ago and then sealed it with poly–that’s also held up really well with daily use and water/spills/crayons, etc. 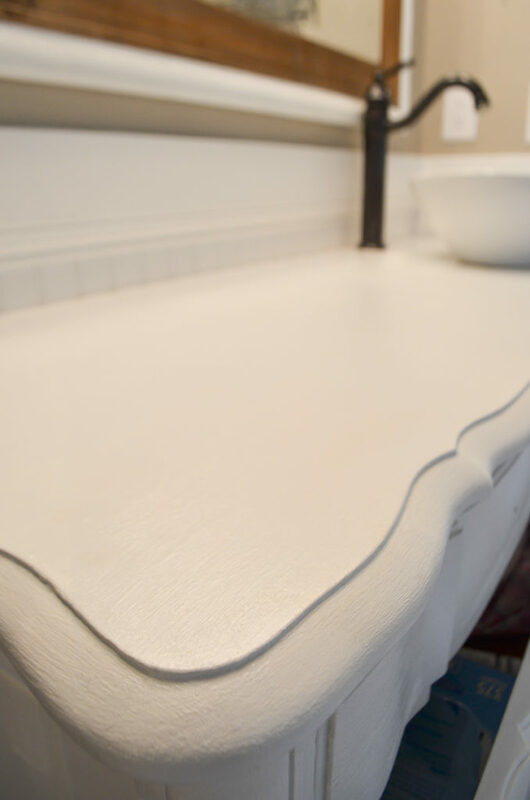 I’m jumping on the band wagon of painted vanities and was curious if the poly you used ever yellowed on your table or vanities? Mine is painted and sitting in pieces waiting for me to decide what type of poly to use. Nope, it hasn’t yellowed at all and I’ve had it on our table over a year now! Hi Sarah, I am so glad I found your site. My question is did you put 2 coats of poylcrylic on the entire vanity or just on the top? I have a dresser that has been re-purposed into a bathroom vanity that will be going into my master bathroom. It wasn’t painted with chalk paint but I still feel the need to apply a couple of coats of poly to the top. Is it necessary to sand between layers of polycrylic? I never sand between coats of poly! 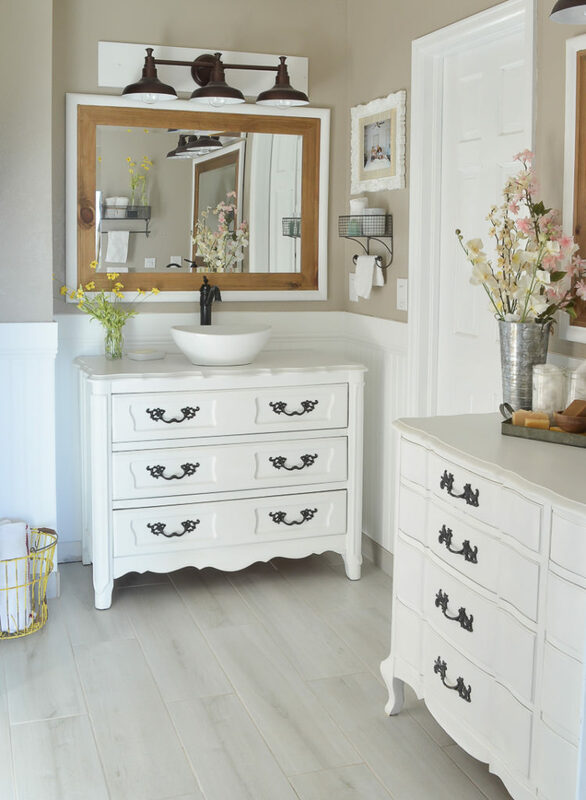 I just stumbled across your bathroom redo and I’ve gotta say – it’s absolutely stunning! 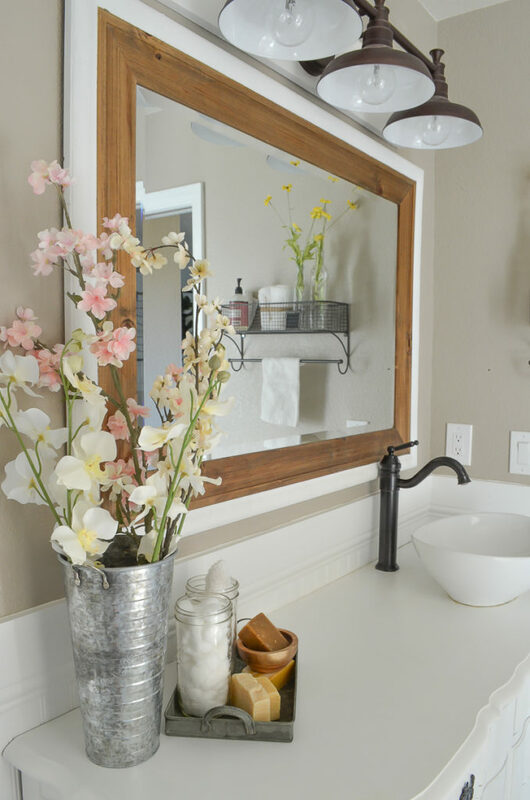 It’s given me some ideas for freshening up my bland master bath. Question – where did you get the mirrors? Thank you for posting in such great detail. 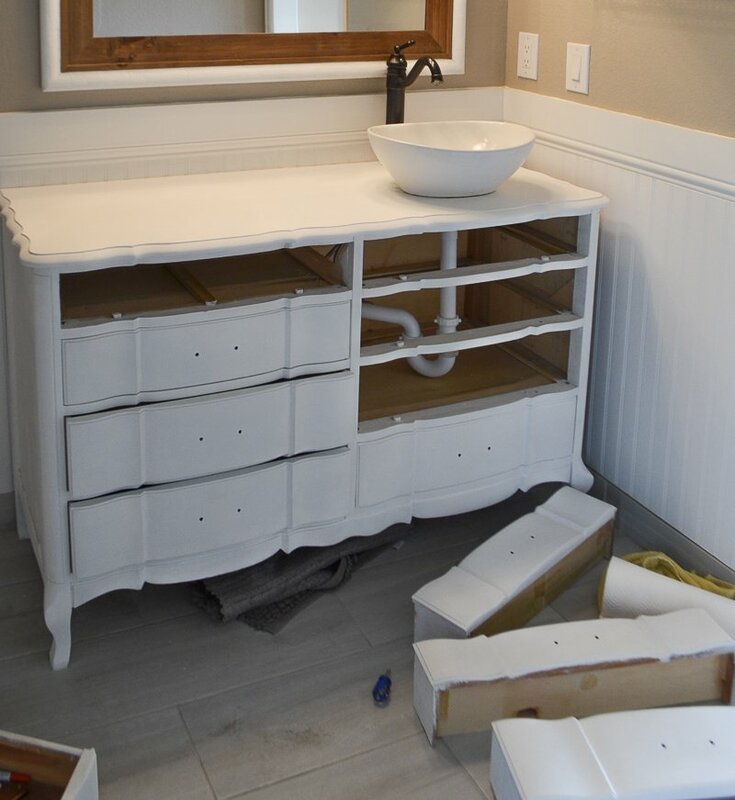 I’m a chalk-paint virgin but have been wanting to try it on a single-sink vanity in a busy bathroom. After reading your reviews, I think I’ll stick with acrylic for this project. The bathroom is small and creates a lot of moisture. I want to learn from your experience. By the way, your vanities look fantastic, and I especially love the way you trimmed the mirror with the frame and wood matting. Nicely done! First, let me say I love your vanities!! I love working with chalk paint, and I use Rustoleum. I refinish furniture for a living, so I have done many pieces. I won’t use anything but chalk paint. 2 things I’ve found that make all the difference when working with chalk paint…1)after painting I sand until I have a smooth surface(this doesn’t take long), 2)applying a glaze really helps seal the paint. When I work on a piece for a customer I always wax or poly the piece. I haven’t done either of those steps on my personal kitchen table, however, and it’s held up amazing. I must also mention that I have 4 boys, so it gets a lot of wear and tear! I’m definitely not an expert, still learning, but willing to share my findings. Your floor looks amazing May I ask what it is and if you did that yourself? Love your newsletter. Thank you for putting this out to share and educate. Love it! Help! I did a dresser vanity conversion and used that poly it and it left a yellow stain all over it. I have read that it happens to others. I am curious if you did anything different to keep it from yellowing. Perhaps the paint I used underneath makes a difference. I used a regular latex paint. Any advice would be extremely helpful. oh no! I’m sorry to hear the poly is going yellow on you Michele. I haven’t had that happen to me (YET!) but I know it’s common. I just used the Rust-Oleum chalk paint on our vanities, so maybe that’s why it isn’t turning yellow?? Sorry I can’t be more help! 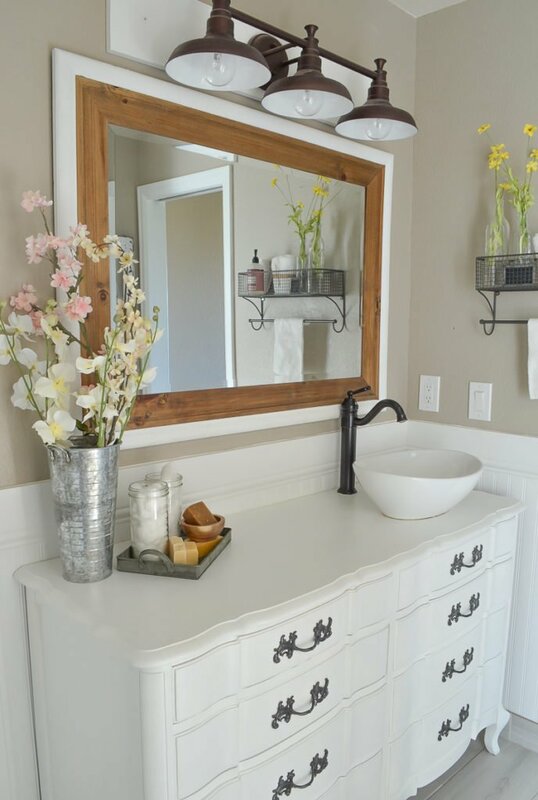 Hello, I used the same paint the linen white rustoleum for new bathroom cabinets and an antique mirror. I did a trial run on the mirror and it left the yellowing stain. It looks good on the mirror but i don’t want it on my cabinets. What do you recommend. You have to be sure to apply the polycrylic in thin coats. If it’s thick, pools or puddles it will yellow. I’ve had great experiences with Varathane Soft Touch Poly in Matte sheen. It’s very durable, I’ve never had it yellow over my paint, and it leaves the softest, smoothest feel to your furniture. Seriously, guests ask if it’s okay to pet my furniture. Wax is always last – unless you specifically buy a water based wax. Most waxes are oil based and if you try to apply poly over it, the poly will peel off/not adhere at all. You can apply the poly, allow it to dry for 4-5 days and apply the wax over that. But, in a bathroom, the heat and humidity causes wax to soften and melt so you’d probably end up smearing it or wiping it off completely after cleaning it a few times. It’s generally not recommended to use wax in the kitchen or bath areas. If you’re wanting the antique look in those areas use a glaze instead. Please excuse me if this question has already been asked but I’m really curious about two things, first when you try to paint originally with the chalk paint and the wax did it completely cure for a month as suggested? And also when repainted I’ve always heard poly over white yellows eventually did you have a problem at all? Question. Do you think this would work for a standard laminate countertop in the bathroom??? Thank you! Do you mean to paint the countertop? I don’t know how that would hold up, I’ve never tried that. Maybe worth a shot?! Hi Sarah, I loved your post as well! The linen white looks so fresh on those cabinets. It’s now April, how has the finish held up so far? Good question! They’re holding up so much better. No dings or marks like before with the wax. Much improved!! However there is still some water issues around the faucet which I need to figure out a better solution for…but otherwise it’s perfect!! probably need to put some plumbers putty or silicone underneath the fuacet so it does not seep under the faucet and into the wood… then use a little more of he polycrylic around where the faucet meets the dresser. I’m so glad I read this as I was about to chalk paint my vanity! So do you still suggest using the Rustoleum and Minwax poly on a piece that has not been painted before? Or would you use something else? Thank you so much, you saved me! Yes definitely. The poly is the key–that will protect your piece MUCH better than the wax. At least that’s been my experience. These vanities are still holding up really well! Have you ever made your own chalk paint? The only kind I have ever used is home made and I love it!! I use Behr satin or eggshell paint with plaster or paris and water. It goes on well, even thought it is thinner, and you do have to sand in between coats, but it has such a soft silky finish to it in the end. I coat with polycrylic if it will be heavily used as well! No I haven’t tried it yet but I really want to! Sounds awesome. Need to add that to my project list. Thanks for sharing Trish! Pixie Dust Paint Company makes a product called Liquid Pixie that is a liquid chalk and mineral paint additive to make your own chalk paint. It’s very reasonably priced and makes a great durable chalk paint when added to those wonderful 99 cent paint samples by Behr (or brand of choice). 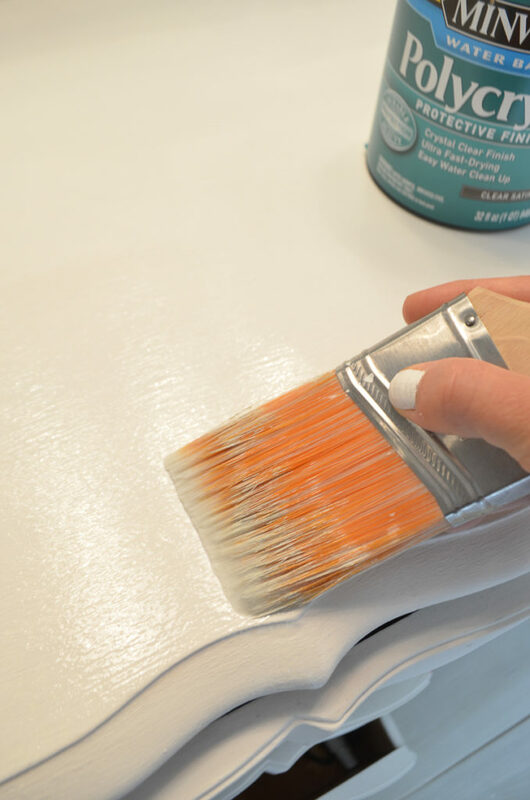 Powdered paint additives like plaster of paris and calcium carbonate, due to their chemical makeup,the particles are attracted to each other even after having been thoroughly dissolved in water, This causes little tiny white specks in your final paint coat that are so difficult to cover. It’s like a fly in the ointment and so frustrating! Liquid Pixie doesn’t do this and gives you and endless amount of colors to choose from. I don’t sell the stuff. I’m just an avid fan and user of it! These are beautiful and definitely well worth the extra love to find the right finish. I’ve often shield away from chalk paint because I want the finish to be extra durable. In high water areas (and on outside pieces) I’ve often finished off (or sometimes, mixed in) yacht varnish. I find this holds up well against water and weather. I was therefore very interest with your choice of finish and I think I will try that out too. Thank you. I am wanting to just clarify, did you put one coat of the poly on? And did you put it just on the top or on the drawers as well? 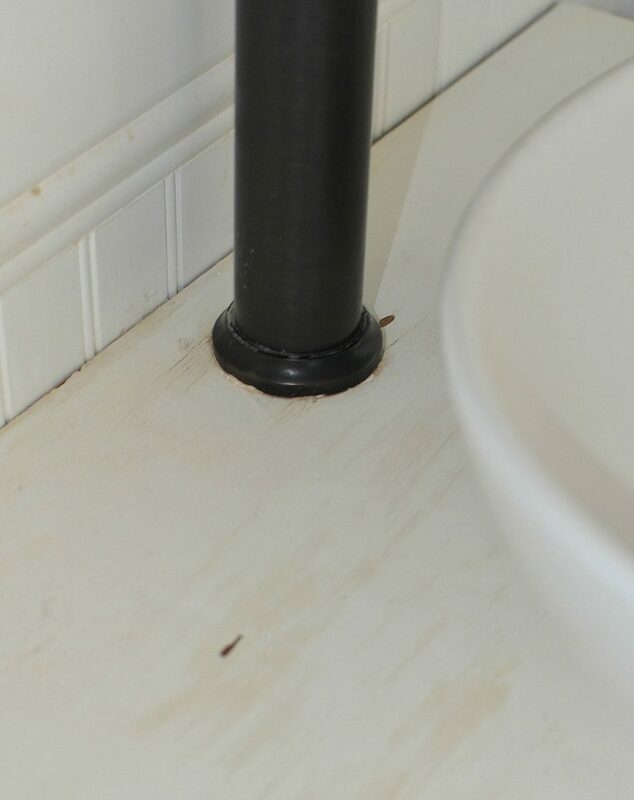 I am chalk painting my bathroom linen tower and after finding this post, I got really excited about the project. So I have the tower painted and it looks great. 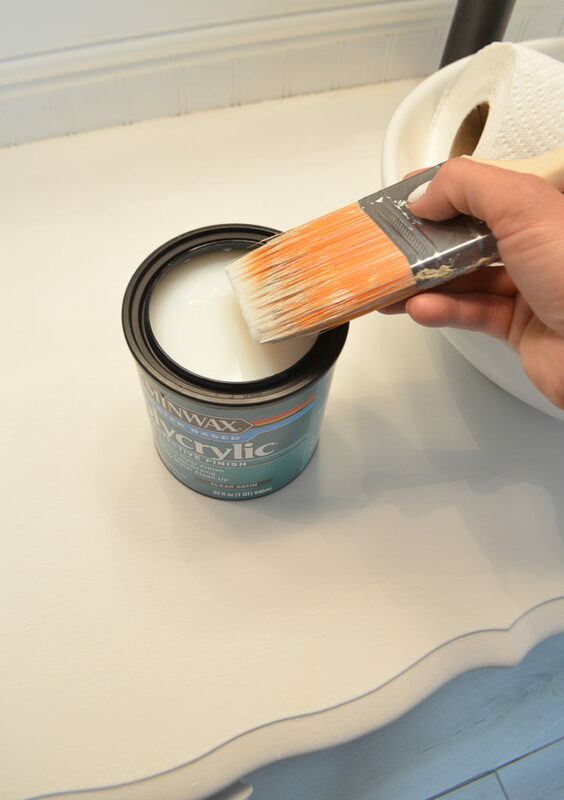 I was very careful with the polycrylic, stirring very slowly and carefully, I dipped in my nice new Purdy nylox brush and as soon as I began to apply the finish, it started to bubble and drip terribly! I attempted to lightly load the brush but the same thing happened! There are bubbles and drips everywhere. I even tried a foam brush but the same happened? What did I do wrong? I sanded the bubbles but they are still visible (320 grit). I’m so bummed, I can’t leave my cabinet unprotected in a bathroom with no windows. Your vanities are just so gorgeous! I used Rustoleum Chalk paint and their flat top coat which is a poly on my bedroom set, and it yellowed on the first piece. I sanded and switched to their clear wax, which I can get away with on the bedroom furniture. I believe it pulled the tannins through the paint from the wood underneath. I want to still use a white chalk paint on my entertainment unit in the living room, which gets a lot of use. So I think my plan will be to prime everything with a water based primer first, then chalk paint, then use Generals clear satin poly. 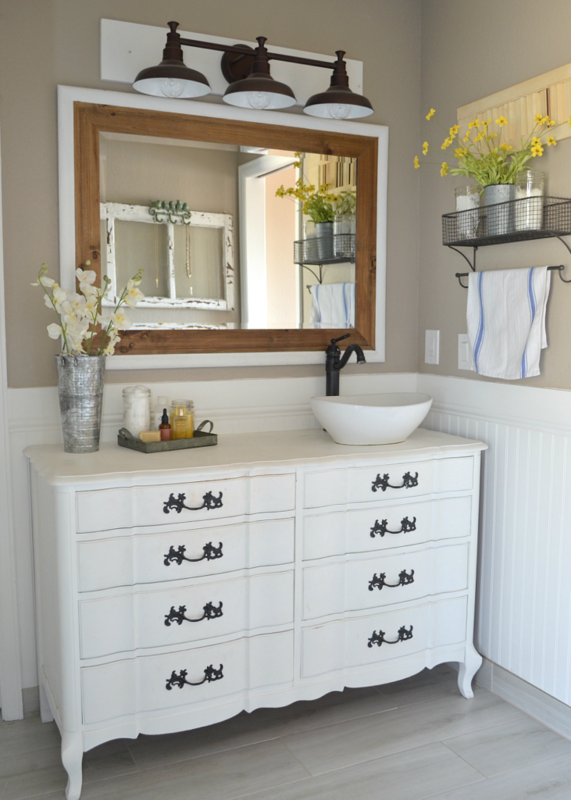 I just paint my diublecvanity and mirror combo in rust oleum chalk paint white line. I have not clear coated it yet. Please tell me does the clear coat turn the chalk paint yellow? Thank you for your candid descriptions & info. I’m thinking of redoing my kitchen cabinets using chalk paint & I just wondered if you think the chalk paint & polycyclic combo would be enough to keep cabinets intact with the heat & grease in a kitchen. Sarah, did you poly just the top or the whole piece? Thanks! Thanks for all the great tips and insight about chalk painting. I have gotten involved with this technique within the last few months and I really enjoy experimenting with different painting techniques. I am getting ready to retire and am looking forward to many more projects. I have used Annie Sloan paint, Martha Stewart paint (too much odor) and Behr chalk paint. I find that the Behr is easiest to use and yields the best results for me. I agree that if you are using a piece in a bathroom or kitchen the wax finish is challenging and needs constant maintenance—who wants that! 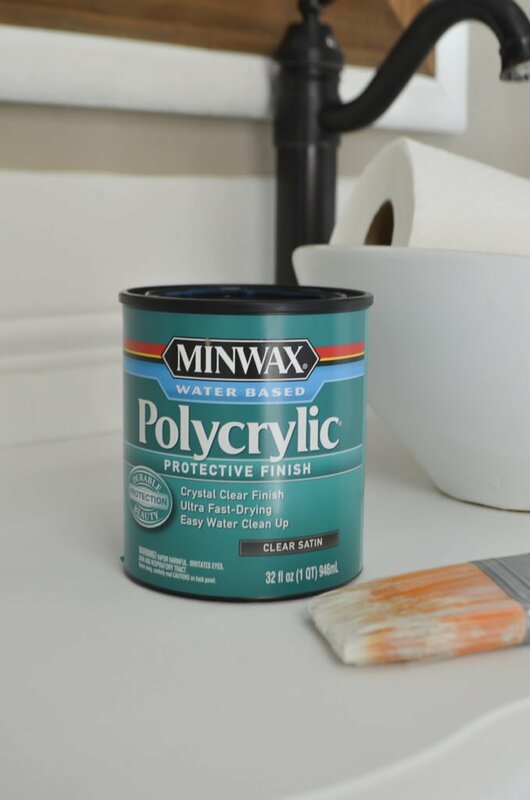 I have not tried the Polycrylic finish but I am going out tonight to get some and try it out.